As South San High School’s Grease Monkey team prepared their robot for competition Thursday morning, a request came across the loudspeaker. “Team 4063 needs glue sticks for a hot gun,” the voice intoned. Within minutes, a team with spare sticks had donated them. The teams might be fierce adversaries on the field, but in the pit, where last minute work was being done on the robots, an air of “gracious professionalism” reined. 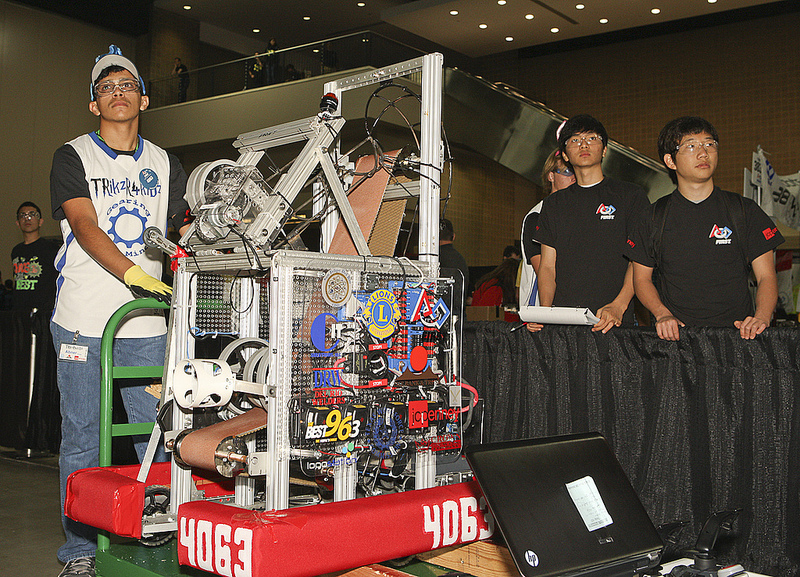 The Grease Monkeys will compete against 170 other teams this weekend at the Henry B. Gonzalez Convention Center for the third annual Alamo FIRST Regional Robotics Competition. Teams from around Texas, other southeast states and even Mexico have descended on the Alamo City to show off their robots’ ability to shoot a frisbee then climb a giant metal structure. One team from Mexico got a big dose of gracious professionalism after the truck carrying their robot was hijacked. The team was exhorted to come anyway, and thanks to donations from local businesses and other teams, the Leones are back in the competition. What they’re doing is learning engineering, technology and scientific innovation at a time when the U.S. finds itself woefully short of workers with such backgrounds. A robot from last year’s Alamo FIRST competition, sponsored by Rackspace. When he first began the robotics program at South San, he said, the team didn’t have much money, so he hit the phones looking for sponsors. Today, major companies like Toyota, Boeing, Lockheed Martin and CPS Energy participate. Facing “a tremendous shortage” of skilled workers, Henry said, they’ve jumped in with both feet to begin filling the pipeline. Like other companies, CPS Energy sponsors FIRST financially, but also through mentorships and other volunteer opportunities. This weekend, CPS Energy employees will act as judges at the regional event, as well as hosting a LEGO competition for younger students. “Our business is getting more technical every day, and we need these kids to be part of it,” says Lisa Lewis, vice president of communications for CPS Energy. The local competition is hosted by Rackspace, which stepped up its commitment after Chairman Graham Weston came to visit the first regional event held here in 2011. “He looked around and said, ‘these are all future Rackers,'” said Patrick Felty, the Alamo regional director for Central and South Texas. 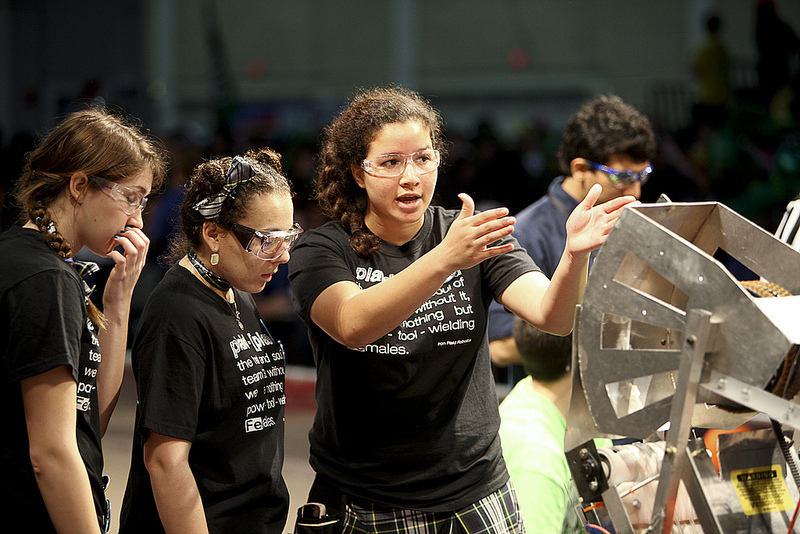 Students from a local team evaluate their robot’s performance at last year’s Alamo FIRST competition. Cesar Gonzalez, an engineer with CPS Energy, has been a Grease Monkey mentor since January. He said the experience has been intense and awesome. Henry says one of the best parts of mentoring is watching a student have an “aha” moment. He recalls watching Gonzalez working with a senior who, thanks in part to her involvement with the Grease Monkeys, wants to be a computer programmer. It’s those kind of moments that can lead to career choices in fields students once wouldn’t have given a second thought. Former South San Grease Monkey Jesus Jurado now works for Lockheed Martin; he now serves as a mentor to current students. Other former team members have gone on to careers with Boeing, Raytheon and other companies. Mary Baughman teaches physics at South San, and is in her second year as head coach of the Grease Monkeys. She said it’s incredible to watch the kids’ confidence grow during “the build season,” when they’re working on their robots. Watching students connect with industry leaders at world class companies is also satisfying, she says. One student this year is applying for CPS Energy’s SAFE program, which offers work experience, mentorship and scholarship money for high school juniors and seniors interested in pursuing a college degree in fields related to the energy industry. Another is vying for an internship at Toyota, where he’d ultimately like to work. Justin Chapko, 17, learned about Toyota’s program through the company’s sponsorship of the Grease Monkeys and FIRST. Elizabeth Michel, 17, is also a senior. One of the team’s programmers, she said it’s “exhilarating to see our program, that we wrote, make the robot do what you want it to do. “I wish I had started earlier,” she said.